The only reason it's so big is because there's no telling what mood will hit me, so I have all sorts of things there :) Hopefully, I'll have enough concentration to finish Gulliver's Travels, which is a TWEM title and long due. 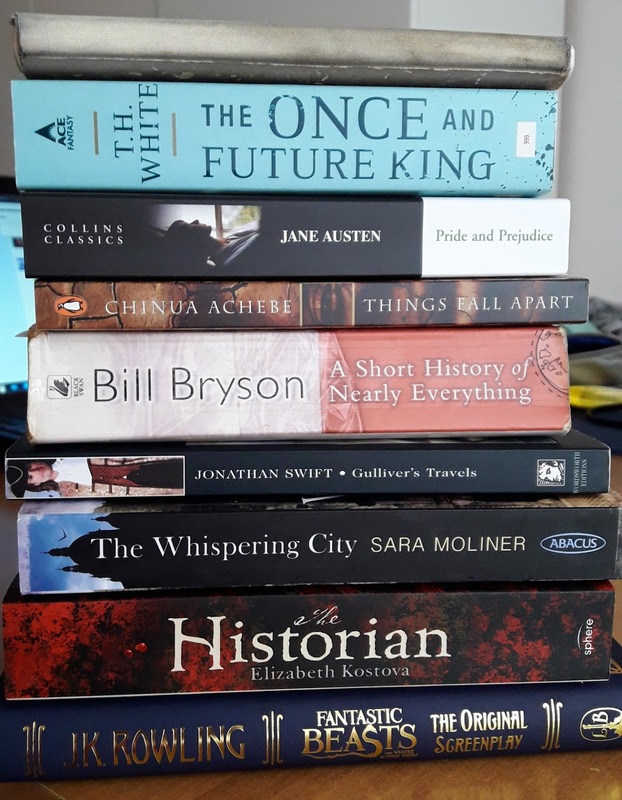 In that case, I'll be able to start Pride and Prejudice which simply can't go wrong :) A Short History of Nearly Everything is borrowed, so I'd like to make a dent in it too. The battered thing on the top is my e-reader, which hosts The Moon is a Harsh Mistress, which I have started but which is yet to impress me enough so that I believe it has really earned its Hugo. Well, and Fantastic Beasts will be for those night hours when I struggle to even keep my eyes open! I'll be posting on Twitter and maybe several updates here. Good luck to everybody participating, and let's have fun! I hadn't planned on joining the readathon, but your stack makes me excited. :) Really interested to hear what you think about The Historian!